When I first read through the Kharadron Battletome I was ready for some Black Library material on them right away. The Battletome does a good job at exploring their society and background, but there's still nothing like seeing them actually interact with others and deal with the varied situations that arise in the Mortal Realms. 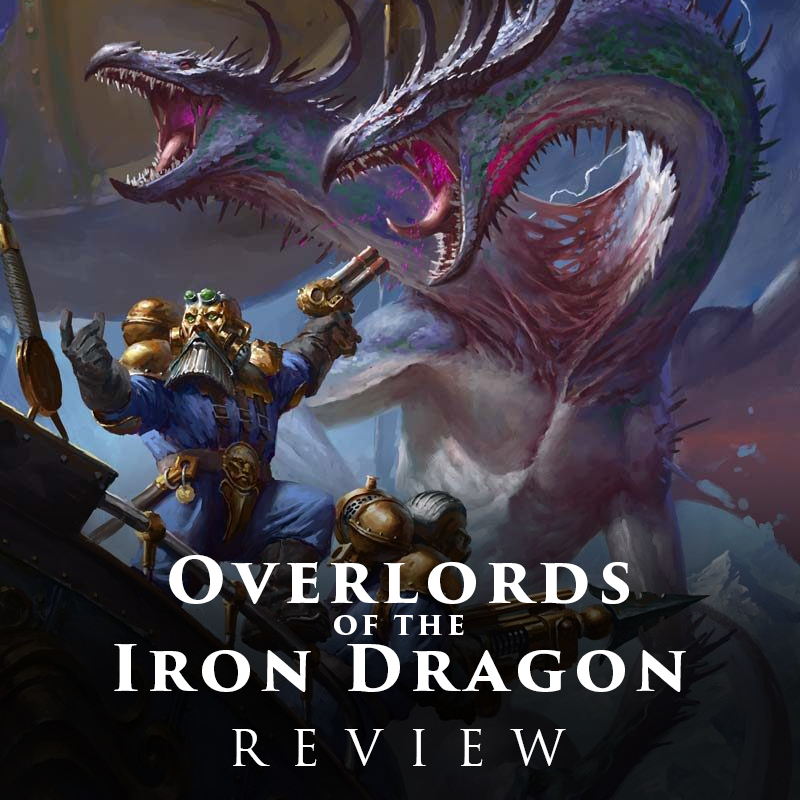 Overlords of the Iron Dragon scratches a lot of those itches, and focuses exclusively on the duardin. There are no Stormcast or other prominent factions to impede on their adventure besides the antagonists, the Disciples of Tzeentch. The book opens with a collection of Kharadron ships getting attacked by the servants of the god of change. A force of disc and screamer mounted Arcanites have waylaid the duardin, and the battle is quickly concluded when their Curseling calls down some unknown monster to finish the job. After this short opening battle we meet the true heroes of our story, a small flotilla from the Skyport of Barak-Zilfin, led by Captain Brokrin and his Ironclad, the Iron Dragon. They are on a fairly standard trading mission, hoping to find enough treasure to offset the perpetual bad luck that seems to follow the ship around after a particularly savage encounter with a dragon sometime in the past. At the start we see a bit of how the duardin operate and interact on their ships. The Iron Dragon has a company of Arkanauts, as well as some Thunderers, the ship's crew, a Navigator, and some Endrinriggers that we don't see much of besides in battles. They also have two smaller Frigates which have followed Brokrin on this expedition. Their first stop is a small human settlement that are frequent trading partners with them. At first this all felt a little "early" AoS since the humans were a tribal people, and not one of the cities that have cropped up recently, but those reservations were quickly put to rest once the story got going. It's fairly common to see cultures reminiscent of European peoples in the worlds of Warhammer, but it's not often that something from the Americas makes an appearance. This tribe of human was clearly inspired by Native American culture and it was really cool to see them in here. C.L. Werner, the author, lives in the American Southwest, so it's not surprising to see that influence in his work. I only wish they were a part of the story for longer. As their trading with the humans, it quickly becomes apparent that something is wrong, and that's when they are shown items for trade that are clearly duardin in manufacture. The human had come across a Kharadron wreck, and so as not to upset their trading partners, they agree to lead the Iron Dragon to its location. This turns out to be the wreckage from the flotilla we saw at the start of the book. Against all odds they find a survivor, Grokmund, that fleets Aether-Khemist. After rescuing him from a horde of Flesh-eaters in a pretty cool action sequence, the Khemist reveals what his ships were carrying; samples of a vein of aether-gold more potent than anything found before. This would be a strike that would make all of them richer than they can imagine, though Brokrin has his reservations. Something just feels off to him, and not only that, since the gold is so potent, it is also extremely volatile, meaning there is a huge risk to transport it in their ships. From here the duardin crew argue amongst themselves on what course of action to take, which ultimately leads them towards the climatic finale. It's hard to talk about the plot too much from this point on without giving away a lot of the cooler moments. There is a really cool aerial battle involving the Disciples again, as well as a truly fantastical duardin hold for the finale which is perfect for AoS. There is also a rather cool twist near the end, which is something I wasn't expecting from a Warhammer story. The plot is fast paced, but still allows you enough time to become invested in each of the main characters. Besides Brokrin and Grokmund, their is also the head of the Arkanauts, Gotramm, who is soon to be wed and looking for a stable future for his wife, and Drumark, the leader of the Thunderers. Drumark is particularly characterful, in the typical, drunken dwarf kind of way. There is also a "master of coin" type character, who is played a little too typical greedy evil guy for my tastes. He's selfish and you know it from the get go. That being said, he is essential to the plot and I did enjoy the ending to his story. On the Tzeentch side of things we don't see much besides the Curseling, Khoram, and the Fatemaster he is eternally pitted against but forced to work alongside. They are interesting enough, but they're never really elevated above being a bad guy. They are pretty cool though, with the Fatemaster described as having his face constantly obscured in smoke from candles on his armor, and the very fact that the main sorcerer is a Curseling instead of a Magister is interesting. There were a few things that bothered me, but most of them are weird, gaming things. Things that are inconsistent with the game. For instance, there are Acolytes flying around on Discs of Tzeentch, which I know needs to happen since everything is aerial in this, but it still just seems odd. The Kharadron also seem to never have their helmets on, even though in the lore they're described as wearing them almost all the time outside of their ship's holds due to needing them to breath. This sin't something exclusive to this book though, and so far all of the Kharadron I have seen in the fiction have been helmetless. When they were wearing helmets in this one though it almost seemed like it was a typical bowl helmet instead of the all enclosing one on the models. I don't know if this is due to the book being written while the Battletome was being developed, but it just struck me as a bit odd. None of this really detracts from the overall story though, which I really liked. If you're a fan of the Kharadron Overlords then this is definitely a must read for you. It does a lot to humanize them (duardinize?) and is a great opening story for them in the Black Library fiction. 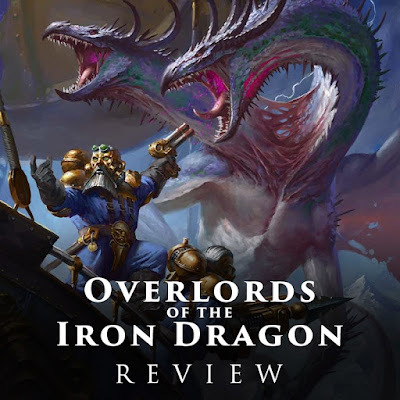 It's great for all fans of AoS to be honest, especially if you're looking for a story that is Stormcast free and explores areas not seen before. The only thing I think I would have really liked to see in this novel was some time spent at the Skyports themselves. They seem like really fascinating settings, and I would love to see them explored more. Hopefully there is a sequel in the works for this and maybe we'll get to see Brokrin as he navigates the politics of Barak-Zilfin. Load up your hold and round up your crew, it's time to set sail. The skies await!